This moment brought me to tears. 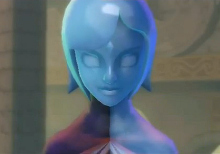 I know that Fi had terrible character development throughout Skyward Sword. Her emotional attachment to Link was never really hinted at or shown. While it makes sense that it would have, to some degree, come out of nowhere, I don’t think it was handled that well in Skyward Sword’s plot. I did appreciate that they tried to make her an active participant in the adventure like Midna was, but the end result was her mostly just giving unneeded advice at annoying times. It was admirable, but poorly executed. But all of that stopped mattering to me during this scene. I still complain about her development because, had it been good, this moment could have been so much better. But that doesn’t change the fact that this scene was highly emotional. Skyward Sword as a whole did a good job with its dialogue; most of the characters’ actions and words felt realistic, and helped the world come alive. That strength of the game is present here. Fi’s actions initially seem almost too cold, even for Fi. At least that was my impression. It feels as though she’s attempting to adhere to her old attitudes too strongly — wording things as coldly as possible even though she normally talks a little more friendly than that — before realizing and accepting how she really feels. The story of an emotionless character developing emotions, feelings, and attachments to their companion is an old one… but that doesn’t make it any less cool or emotional. When Fi thanks Link, it added a little something to the game that I’m not sure anyone else noticed (and perhaps I imagined it): It seems like she’s referring to the people you help as part of the Gratitude Crystal sidequest as much as she is the people you help as part of the plot (not many, and mostly only on the surface). Whether this was intentional or not, I think it is effective at tying some of the sidequests into the main story, and it’s surprising to see that at the end of the game. The dialogue, alongside the two different songs that play for this part (stirring arrangements of Fi’s Theme, already a beautiful song), helps make the scene so emotional. It’s rare for anything to be able to make me cry, but this scene did it, and that’s the reason I consider it one of the most powerful in Zelda. I managed to predict that a scene something like this would happen in the game, but that didn’t lessen its impact for me. I love this moment to death. So how about you? How did you feel about Fi throughout the game, and did you think her sendoff was fitting? Did you find it emotional? Tell me your thoughts on this moment in the comments!